You've found the “U.S. Texel Sheep Breeders” page here at Hobby Farm Wisdom! If this is the first time you have visited our site: Welcome! Texel is a breed of domestic sheep that is native to the island of Texal in the Netherlands. Today, Texel’s are one of the most popular meat breeds in the Netherlands, accounting for approximately 70% of the national flock. This breed has also become popular as a lean meat sheep in the United States, Australia, Europe, Uruguay and New Zealand. 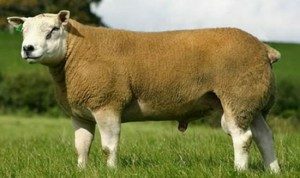 Texel sheep are extremely muscular and produce a lean meat carcass. They also pass this quality on to their offspring when cross-bred. Texels have a unique appearance with a short, wide white face, black nose and wide, short ears that are carried almost horizontally from the head. The wool produced from Texel sheep is considered medium grade and often used for hosiery yarns and knitting wools.